We collapsed into our seats at church Sunday morning, worn out after an intensive two days of emptying our storage pods into our new house—moving furniture, hauling boxes, and trying to make snap decisions on where everything should go. Two days of violent thunderstorms, driving rain, and up to six inches of hail made the process a bit more “interesting.” Now, with the hired movers gone, we’re left with rooms full of boxes. I admit to feeling more than a bit overwhelmed. How in the world will we fit into our downsized digs? It seems as if everything that can hold things—bookcases, cabinets, and the like—are buried behind the boxes of books and linens that belong in them. 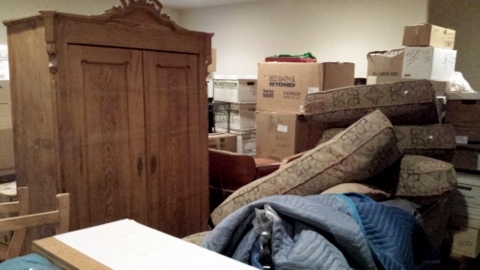 But the room is so full, there’s no place to put the boxes so that we can extract the furniture, and no way to position it correctly so we can start unpacking into it. At the moment, downsizing doesn’t seem like much fun! We intentionally built a house smaller than the one we’ve lived in for the past 21 years. God’s word to us was “simplify” and we’re trying to do just that. Before we reach that blissful state, however we have a lot of work to do. I had promised myself we would only keep what fits comfortably into the space we have. Everything else must go. As I unpack box after box, the “garage sale” pile grows ever larger. Creating space means eliminating clutter, items we no longer need or use, even thoughtful gifts that mean much because of our love for the giver, but that we are keeping merely for sentimental reasons. Downsizing also means making decisions on which activities we will continue to engage in, and which belonged to a previous season of life. For example, I once made a quilt. It was fun, and our daughter is now keeping it for her daughter. However, I am not now a quilter. So the saved fabric, the patterns and templates, and the quilting frame that had languished in the attic have all found new homes. Someone else is enjoying them, and I have more space. As we sort and eliminate, Pete and I are asking ourselves what is truly important, essential even, in keeping with our God-given talents and callings? And, what is good and enjoyable, but is not for us? We’re finding that we just don’t have room for the fluff. So there we were, sitting in church. As the service started, our worship leader took a moment to say a few words, reminding us that we need to intentionally make space for God in our lives. That short little message hit me like a ton of bricks. God was telling me that I need to do the same thing with my time that we were doing with our belongings. There are so many fun, good, even spiritual demands for our attention, that it would be easy to fill our days (and nights) with them but not have room for God. But we all live in a “house” that only has 24 hours per day. We can’t add more. So our time commitments need to fit. That means that everything extra has to come under scrutiny. As much as I desire to make space in my house, I need to make space in my life. And just as bookcases look better with some empty space for a few decorations, so does leaving space in my schedule allow for special moments of rest or discovery. Besides, leaving margin allows me to be available when God wants my attention or service. This entry was posted in Faith & God, Lessons Learned, Stewardship and tagged clutter, freedom, margin, space, time. Bookmark the permalink.